Happy Saturday morning, girlies! I'm so happy the weekend is finally here. Not much stamping going on around my house these days; I started running on the treadmill after work again, so my days have been spent working out instead of stamping. I think I will appreciate this choice when swimsuit season rolls around again! LOL! Unfortunately sometimes this means I'll be neglecting my blog. But in my search for balance, I'm trying to be okay with this! And the penguins! How freakin cute are they? Last month I got 2 of Heather Nichol's stamp sets, called "Warm Happiness Too", and "Little Bitty Bird". Both of these sets adapt easily to Valentines cards! On this one I tried using Kraft paper in honor of Heather, however I will never have the knack she has with using it! I tried to stamp red hearts on kraft and then brighten it up with my red polka dots. I showered this card with hearts and buttons and glittered the hearts up. Hmph. Not sure if I love it or not, but the birdies seem to be enjoying themselves! Hope everyone enjoys their weekend and has a Happy V-day on Monday! Sympathy card day - cat themed! This one was a stretch, but I did manage to use the goldfish/cat from Raisinboat's "Cattitude" stamp set to create sympathy cards. I thought it would be okay for a grieving pet owner to remember the good times too! I also found this paw-themed EK Success punch at JoAnne Fabric for 40 percent off..I decided to splurge and grab it, because I know it will get used for shelter projects. Aaack, Monday again! Well, I got a ton more animal cards done this weekend, so I'm cranking along here! Today I wanted to show you some of the animal sympathy cards I made for my shelter project. 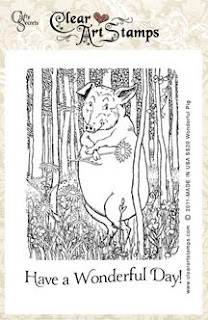 Animal sympathy cards are definitely the best sellers in my shelter basket. I believe it's because they are hard to find in a regular greeting card store anywhere! This is the little curled up dog stamp I was telling you about yesterday...he can be used for sympathy or 'sorry you're sick, or 'ruff day' cards. He's from Raisinboat's stamp set called "A Dog's Life"
These are super easy to color, so I can crank out a ton at once. The patterned paper is from a big block of scrapbooking paper that a friend gave me as a gift a MILLION years ago (USE IT UP!). The 3-d paw is a die-cut I found at Archivers - I cut a ton out of brown paper and added them as an embellishment. The sentiment is from a Raisinboat stamp set called "Paws to Remember". Good morning! Today is day (2) of showing you the samples I've been making for my "Project Animal Hearts" - making cards to benefit animal shelters and humane societies. My goal with these cards is not to reinvent the wheel or come up with a new technique, it is to create a large number of cute cards in a small amount of time. So I kept my layouts simple. I created a bunch of thank-you cards, meant to be given to an animal caretaker or friend...you know, the ones that let your dog out when you can't get home in time, or take your pet for the weekend when you're out of town? These little barky yorkie cards were created with a stamp set from Raisinboat called "A dog's Life" - one of my favorite sets for making shelter cards with, because the other dog in the set (the one in bed) is PERFECT for pet sympathy cards. I'll show you sympathy samples tomorrow. The patterned paper here is by Heidi Grace....I bought it at Michaels 2 weeks ago on CLEARANCE for .29 per sheet! I bought a ton of sheets because it was so cheap, and the opposite side of the paper is that green plaid, that mimics GRASS! QUICK! EASY! CHEAP! The inside of the card has more "BARKING" and then a sentiment that says "THANK YOU, YOU'RE THE BEST". I invite you to CASE any and/or ALL of my cards for this project - if you want to participate, please take whatever inspiration you need in any form. The goal here is to USE UP paper, create something from nothing and help raise money for shelter animals. Good morning, everyone! I'm finally ready to start posting pictures of my latest stamping project. First, a little background for you. Last year I had to put my pet to sleep, and while I was waiting in the vet's office, I noticed a donation box in the lobby, asking for help to build an animal shelter in my hometown. Recently there's been many stories on the news about animal shelters across the nation closing down, due to lack of donations with the recession. A light bulb went off in my head; I had a room full of patterned paper, cardstock, and embellishments just waiting to be used. What better way to use stuff up than to make cards to encourage donations. So I started cranking out pet-themed birthday, sympathy, thank-you and "Congratulations on your new pet" cards. I put about 40 cards in a basket with some envelopes and a sign that read: "Greeting cards $3.00 - put donation in animal shelter donation box". A few weeks later, I got a call from the vet telling me that the cards were ALMOST GONE! I did the math in my head; $3.00 x 40 cards = $120 toward the shelter. So I made 40 more cards and I was off and running. I'm telling you this story, not to toot my own horn, but to encourage you to sort through your old patterned paper & grab some stamps...each of us can make a small difference in the world, by using our stamping & scrapbooking talents to help worthy causes. So. Every day this week I will be posting different animal-themed cards, in hopes of inspiring you to pull out your animal stamps and start making a difference. Ask your vet if you can put a basket on their counter and a donation box...it's as simple as that. I have become bored with the few sets of animal stamps I own, so this month I rented a bunch of stamps from RAISINBOAT and started cranking out cards again! 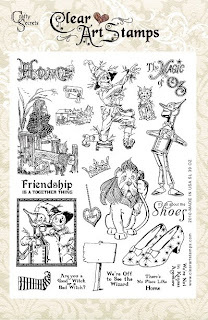 If you don't have animal stamps but would like to participate, I encourage you to go rent some from RAISINBOAT - get your stamping friends together and have a shelter party and crank some cards out. I will tell you this, you will feel good about doing it. And you will USE UP stuff from your CRAPFT supplies. So come with me on a little animal heart journey this week. More to follow! Hugs, Lisa. And she does it AGAIN! 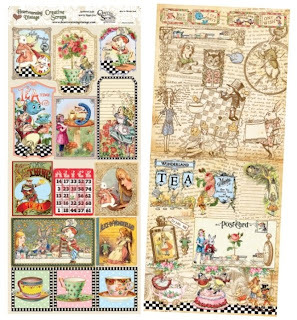 Just when I thought the last Alice in Wonderland set couldn't get any cuter, Sandy Redburn from Crafty Secrets rocks my world with MORE cool images like the mad hatter, a sweet little mouse, Alice, and blank teacups that can be stamped on patterned paper for fun shabby teacups! This set is called Tea with Alice, and I'm absolutely MAD for it! 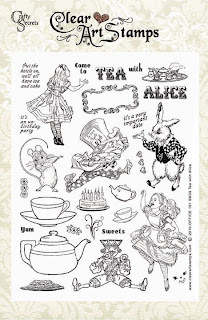 There are also new creative scraps with tons of Alice images for you to use in scrapbook pages, layouts and cards! Sandy will be releasing more sets this week on the Crafty Secrets blog HERE...make sure to stop by and check out all the new goodies! Hi again! I thought that today I'd post some more vintage valentine inspiration for you. Yesterday's valentines were more from the 50's era..these are definitely VICTORIAN and putzy! I scored these last summer during a junking adventure. I love the multiple layers on them, and how lacy they are. Hi girlies! Life is crazy here in snowy MN...I'm a travel agent, so I'm fielding calls left and right for people whose flights have been cancelled from the snow! I just heard that out of the 48 continental US states, 47 have snow...the only exception is FLORIDA! Girls, let's all head to FLORIDA! The good thing that happens when the weather is cold and snowy, is that I hit my stamp room after work and lose myself in creating cards. Last week I was busy creating valentines. Here is another Unity valentine, made with Unity's "Rockin It, Unity Style" stamp set. This fun little gumball machine is easy to color, and I can crank out about a million of these, easily. I promised to show you some of my vintage valentine collection...I love how simple and sweet they all are! Hope you are as inspired as I am by them! Morning girlies! Well, we made it through the first week of the year, and so far I'm optimistic that this year will go better than last! I've been working on Valentines again, and had ordered a kit of the month from Unity called "Rockin it, Unity Style". This kit is packed with fun images that are simple to color and have great sentiments! I'm always drawn to stamp companies that coordinate their images with great sentiments. I used some fun, bright papers from My Minds' Eye and Bo Bunny that have primarily red colors in them, and turned this little jukebox into a valentine card! I glittered the jukebox up with some fun "punk" purple glitter from Our Craft Lounge. I'm sort of on a glitter kick this month with all my cards, so you'll be seeing sparkles on everything right now! I've been trying to organize my stamps by putting them into jewel cd cases; I bought a whole box of empty cd cases in bulk from Uline. (Thanks for the tip, Carol!) Because this Unity kit had so many images, I had to use 4 cd boxes for this set~ so I figured out that you can use a big ribbon, threaded through the top case, to gather the boxes together. Baby steps into the organization! My Mom found this great cd holder at a garage sale for a buck. It has handles on the top and bottom, so if I need to move this, I just tip it sideways and carry it as is! HANDLES! YAY! Yikes, I just noticed my ribbon holder needs some love. BIG SIGH~!